HL was born in 1973 as HL International Sports. It started with one product, the HL Champion feather Shuttlecock. This very special product instantly became the industry standard and the #1 choice for local, regional, national, and international tournaments all over the Western Hemisphere for the next 20 years! The HL Champion’s legacy continues with HL Badminton’s tournament quality feather shuttle, the Pro Tour PT-60 Shuttlecock. In 1975, Mr. Richard Haglund (founding partner and the “H” in the “HL”) invented the process of using graphite fibers in the production compound curves (Haglund was an aerospace engineer). Soon after the first graphite badminton racket was born, the “HL Graflite”. Haglund, with the help of Wes and Dean Schoppe, made each racket by hand in Haglund’s garage in the evenings after he was done with his aerospace job. Haglund’s 2nd generation HL Graflite badminton racket eliminated the T-joint that connects the shaft to the head, and the rest is history. Haglund traveled to Taiwan to manufacture his innovative design. Soon after, Taiwan manufacturers “borrowed” his technology to produce graphite rackets for tennis, badminton, squash, and racquetball. In 1981, Guy Chadwick and David Levin, teammates from the 1978 ASU Collegiate Championship Badminton team, purchased HL from Mr. Haglund. In 1986, Dean Schoppe merged his badminton company with Chadwick and Levin to from the company that is known today as HL Badminton. Now, more than 30 years later, the three HL Badminton partners continue to work tirelessly to bring their customers superior quality badminton products at an affordable price. Additionally, with a shared life-long love and dedication to the sport, they work personally, and as a company, to support the grass roots development of badminton at every level - recreational, junior, high school, and tournament play. Guy Chadwick, David Levin, and Dean Schoppe - all are players, coaches, and administrators with a combined badminton experience of more than 130 years. Between them they have run hundreds of local, national, and international tournaments, and have conducted thousands of badminton exhibitions, camps, clinics, and academies, coaching novice to Olympic and Paralympic badminton athletes. They have numerous relationships with top players and coaches throughout the world and continue to stay current with the latest developments in the badminton world including the latest training methods. 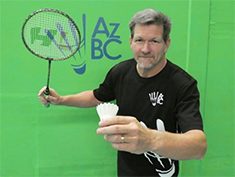 In 2012, Guy opened the Arizona Badminton Center (AZBC) - the first dedicated badminton-only facility in Arizona history. In 1989 he founded the Arizona Badminton Commission. He continues to serve the Arizona high school badminton system by overseeing officiating, and running tournaments, training camps, clinics, and exhibitions. 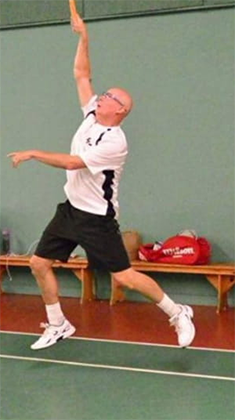 Guy has written a handbook of “Championship Badminton Drills” and numerous other instructional materials with thousands of copies distributed to coaches and players nationwide. Guy is the all-time winningest collegiate head coach in the US after leading the ASU men’s and women’s badminton teams to 15 national titles during his tenure from 1988-1993. Half of the first U.S. Olympic badminton team in the 1992 Olympics trained under his supervision at ASU. Guy was elected to and served on the board of the USAB and was honored with the US Players Appreciation Award in 1993. David started playing badminton in a P.E. badminton class at ASU in 1972 and quickly excelled to letter as a varsity badminton player from 1974-1977. He won the men's singles titles at the Arizona State Open in 1978 and 1979. In 1978 he led both the women's and men's teams to national titles while serving as the ASU head coach. In 1978 he graduated ASU with a K-12 teaching credential specializing in Exercise Physiology and Bio-mechanics. David is an expert in badminton fitness. After graduating, David moved to Manhattan Beach, CA where he has worked with the MBBC Junior development program for 38 years. He served as the MBBC Junior Badminton Chairman in 1983 and 1984 and chaired the US Junior National Championships in 1984 at MBBC. In 1985 David served as head coach and played on the first US team to participate in the Maccabi Games in Israel. He led the team to a Silver medal while also taking home the individual Silver in men's singles. During the mid 1970's and the 1980's David participating in regional and national tournaments maintaining a top 20 U.S. ranking in singles and a top 10 ranking in men's doubles. More recently he has won senior men's doubles titles in AZ, CA and Canada. Since 2011 David and his wife Cindy have chaired the Dave Ogata MBBC Masters Tournament, welcoming senior players from all over the Western Hemisphere. Dean began his badminton career as a junior at the Manhattan Beach Badminton Club in the 1970s. In college he played for Cal State University Dominguez Hills. Dean earned a place on the USA National Team from 1989-1993, has been a member of the US Pan American team multiple years with extensive international tournament experience throughout the Pan Am zone. He won the Brazil Open in 1998 & 2000 and has been a finalist or semifinalist in Open tournaments in Puerto Rico, Cuba, Mexico and Guatemala. He was a member of the US Thomas Cup team in 2004 which won the Pan Am Zone title. Dean has also traveled extensively world-wide and has qualified for and played in the 2003, 2005, 2006 and 2009 World Badminton Championships. Dean is a worldwide badminton ambassador. Dean works tirelessly with developing players, young and old. 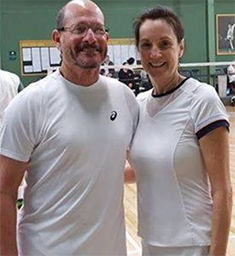 He taught at the Jim Poole Academy of Badminton for 7 years and instructed with Dr. Don Paup for 10 years at the George Washington University badminton camps to name just two. In 1987 he coached the Colton High School badminton team to a CIF Championship. He is currently coaching wheelchair badminton and other Paralympic athletes. Dean served as the USBA National Junior Development Chairperson and USBA Olympic Player Development committees, as the USBA Pan American rep for 12 years, and PASO rep for the USOC. He continues to instruct at numerous national convention and physical education workshops and is an adjunct professor at CSU-Dominguez Hills. He was featured in the 1989 teaching video "Badminton Winning Fundamentals" and authored "Badminton for Physical Education and Beyond" (1997), now in its 3rd edition-Hunter Text Books, ISBN 0-88725-287-7. Dean was honored with the national Ken Davidson Memorial Sportsmanship Award in 1993 and the NAGWS Presidents Award in 2000.